The rest of 2011 is set to be a huge year for Yousef, arguably his strongest yet in the production field. After spending much of 2010 recording remixes and productions for other leading labels Yousef has come back super-strong on his own seminal Circus recordings, dropping the Circus Reworks EP as a precursor to his experimental and far reaching sophomore album scheduled to blow up later in 2011. It is centred on a very simple premise; taking eight pieces of music and recreating them with Yousef’s indiscernibly brilliant club night in mind. 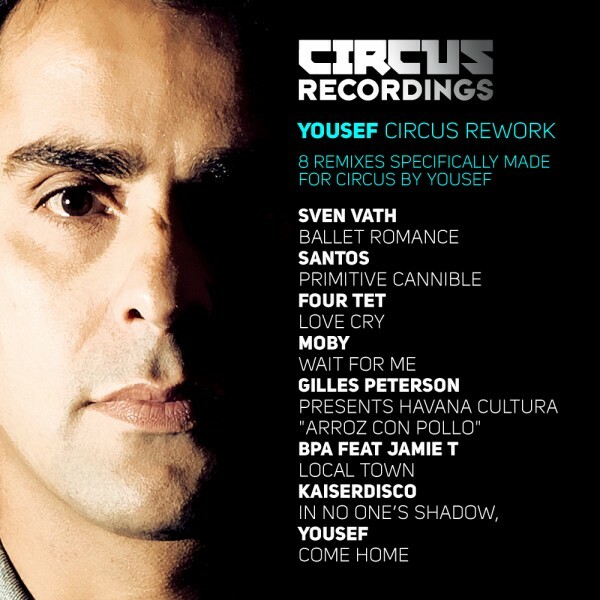 A resolutely dance floor-focused collection, they combine to create a unique aural tapestry representative of the Circus and Yousef’s own musical evolution. Each is an intricate and heartfelt paean of love to Circus and the huge impact it has had on both clubland and Yousef’s career for the last almost nine years, with the club’s birthday approaching this September. It was a casual conversation with Sven Vath at the Circus presents Cocoon event in Liverpool where the pair DJed together led to the transformation of ‘Ballet Romance’ from one 45 second album interlude into a chugging display of Teutonic elegance. Evocative of the deeper aspect of Yousef and Sven’s techno side, it has already been picked up by Hernan Cattaneo, Nick Warren, Mathias Kaden and Carl Cox. The vibe is more outrageous on the Santos rework, where ‘Primitive Cannibal’, arguably the biggest underground smash of Ibiza last year with heavy support from Luciano and Ricardo Vilalobos, is reinvigorated into a blood curdling cacophony of carnival infused beats which has smashed the Theatre at Circus on many occasions in recent months. Kieran Hebden was instantly enamoured with the idea of Yousef remixing his ‘Love Cry’, and with the result a gorgeous slab of melodic tech house that reverberates brilliantly around the haunting female vocal you can understand his immediacy in sending the parts over as soon as Yousef requested them. He’s not the only one; John Digweed has been making it a focal point of his set since Yousef first entrusted him with in March. Two more artists that have been a huge part of Yousef’s musical recent history are also present here and have been transformed by the producer’s keen ear. The material contained ranges from the melancholy opines of Yousef’s rework of Moby’s ‘Wait for Me’ to Gilles Peterson’s Havana Cultura, with Yousef’s keen percussive take on ‘Arroz Con Pollo’ transforming the quirky Latin rhythms of the original into a drum heavy groove, with Peterson retorting that the cut “was more Gilles than Gilles”. A Remix of Brighton Port Authority (BPA) featuring Jamie T (Norman Cook’s latest alias) and Santos are also included both at the bequest of the artists themselves. BPA’s skank of ‘Local Town’ is transferred into a dubby drum led peak time workout, using Jamie T’s vocals to brilliant effect to drift in and out of the tracks central chicago pulse. The penultimate track is the more energetic but no less emotive rework Yousef added to Kaiserdisco’s ‘In No One’s Shadow.’ The hottest techno duo in dance music wanted to the Yousef touch and its gladly included on this monsterous release. The Cocoon connection finishes off the collection, with a brand new remake of Yousef’s classic ‘Come Home’. Arguably the man’s finest hour, the string drenched original has been transformed into a more pumping cut which has the end of the night euphoria of Circus perfectly in mind. It’s a scintillating end to an EP that showcases Yousef’s sound brilliantly; haunting melodies, acerbic percussion, meticulous drum programming and earth shattering grooves. Eight cleverly crafted textures of the musical manifesto that has defined Yousef and the clubnight he has created.